Domenico Starnone’s Trick is the latest treat for Asymptote Book Club subscribers. 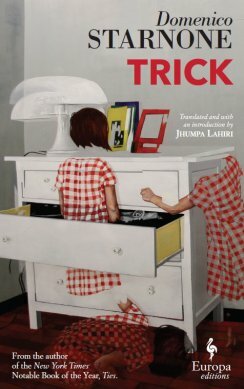 Trick by Domenico Starnone, translated from the Italian by Jhumpa Lahiri, Europa Editions. 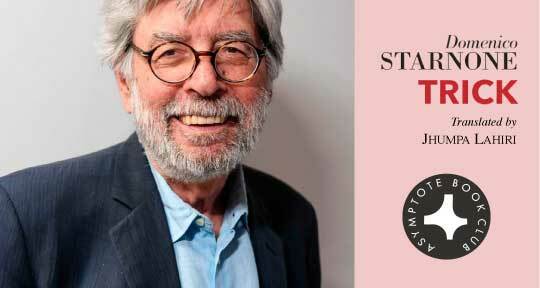 In Domenico Starnone’s Trick, beautifully translated from the Italian by Jhumpa Lahiri, an aging artist named Daniele Mallarico returns to his childhood home in Naples to babysit his four-year-old grandson, Mario. When he is not engaging in battles of will with the child, Daniele struggles to complete a series of illustrations for a new edition of a Henry James story, “The Jolly Corner.” Like the narrator in James’s story, Daniele’s homecoming forces him to confront the ghosts of his past. For Daniele, the ghosts take the form of unfulfilled expectations, failed relationships, and strange apparitions. Trick takes on an impressive array of themes: art, aging, generational shifts, the nature of creative talent, and the powerful effects of chance. The novel’s innovative structure includes an appendix with notes and drawings by the fictional artist-protagonist and Lahiri’s introduction to the translation adds another layer of complexity. She explores the parallels between Starnone’s novel and James’s ghost story and builds on them by describing the ways in which process of translation leaves ghosts behind. Trick is not a ghost story, but its exploration of dark themes will surely haunt the reader. Victoria Livingstone is an assistant editor at Asymptote. She holds a doctorate in Hispanic literature and teaches Spanish at Moravian College. She researches translation history and translates literature from Spanish and from Brazilian Portuguese. Her first book translation was Song from the Underworld (Achiote Press 2014), a book of contemporary Maya poetry by Guatemalan author Pablo Garcia. She also writes frequently on social issues and contributes to a number of publications as a freelance writer.